I'm in the market for a 486 laptop, probably DX4/100, and I was wondering, which laptop was the pinnacle of the 486 era? Opinions? Experiences? The ABSOLUTE best 486 laptop to buy is one with a WORKING battery that holds a charge!! I can't count the number of times I have purchased a vintage laptop only to find that I need another $189.99 to buy a replacement battery. So, wall wart gets plugged in, laptop get tested to see if everything works, wall wart is unplugged and laptop sits. I don't know if there's any one 'best' due to the rich variety of features available. What's best is whatever is best suited to your particular needs. That said, as far as quality, there are many very good brands, and just as many opinions about which is the best, but for the inexperienced buyer, you can't go wrong with good ol' IBM. Try to find a ThinkPad that has features that are important to you. It'll take a bit of comparison, but it's better that way because the shopping is a learning experience as well. I've always liked the WinBook XP, just because Microsoft stole the name from it. I'm curious--why a 486 specifically? Why not a 386 or P1? I'm looking for a cheap laptop, and the first computer I ever owned was a DX4/100, and it was the last generation before the 3D era. I considered a Pentium 90 or Pentium 100, but then I figured I might as well go Pentium II if I went there (and I may, but they're expensive relative to other old laptops because they're on the fringe of modernity and can run XP). Anything with a real 486 in it plus a nice TFT screen and a working battery works for me. I do have a 486slc2 laptop with a DS mono screen (640x480) and a dead battery. 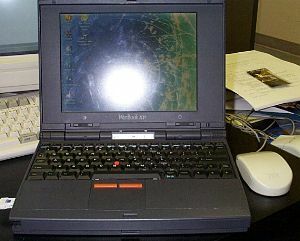 How can we forget the IBM ThinkPad 701-series with "butterfly" keyboard? It's probably the most collectible and sought-after 486 laptop.